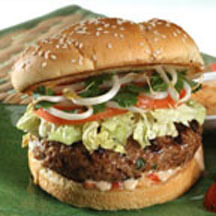 CooksRecipes has quality, kitchen-tested recipes for turkey hamburgers and cheeseburgers that you can count on for successful deliciousness. You don't have to visit Beantown to enjoy one of these tasty turkey burgers topped with baked beans and crispy strips of bacon. 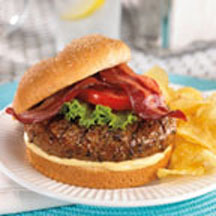 Ground turkey and turkey bacon give these grilled burgers all of the flavor with less fat and calories than a traditional cheeseburger. Infused with a robust combination of Asian flavors, these turkey burgers are perfect for year-round entertaining.